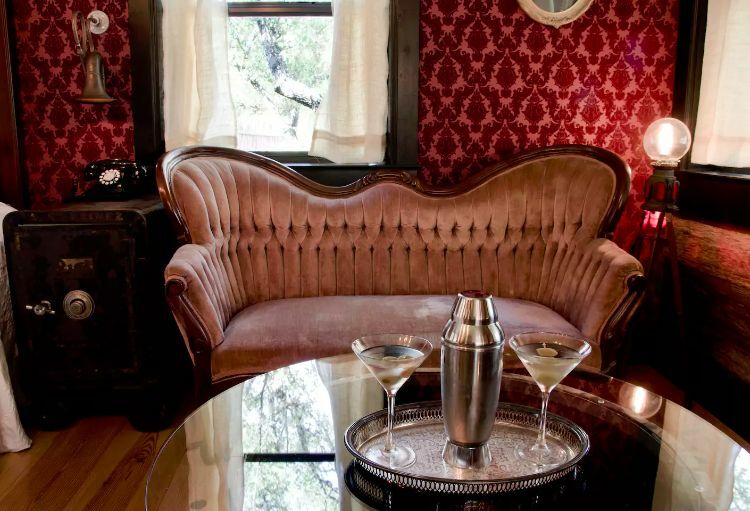 Decked out in vintage furniture and a steampunk flair, the Moonshiner cabin in Wimberley, Texas, transports you back to the rough, tough, and totally glamorous prohibition era. 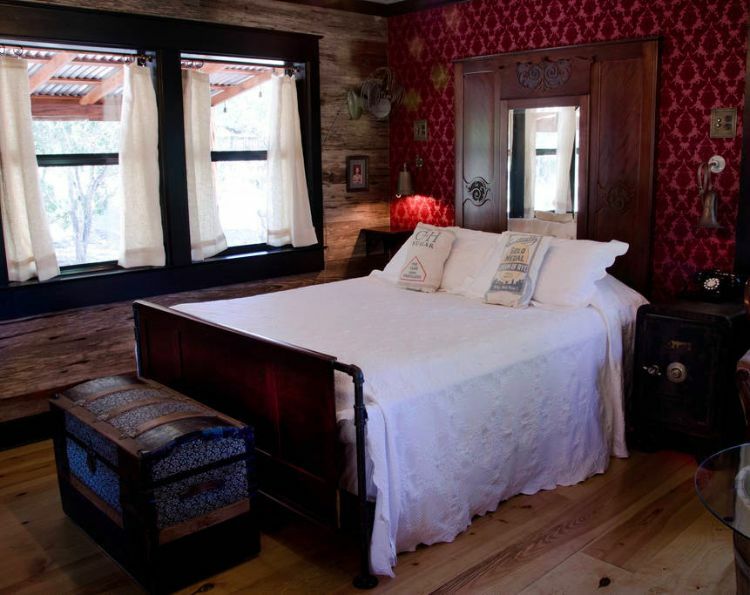 Lovingly restored and renovated by Lone Star residents Jennifer and Gregory, this log cabin home oozes with love, craftsmanship, and genuine flair. Each and every detail was obviously hand picked - giving this home a vintage vibe with all the modern amenities you desire. Take the tour of this unique property and prepare to fall in love. 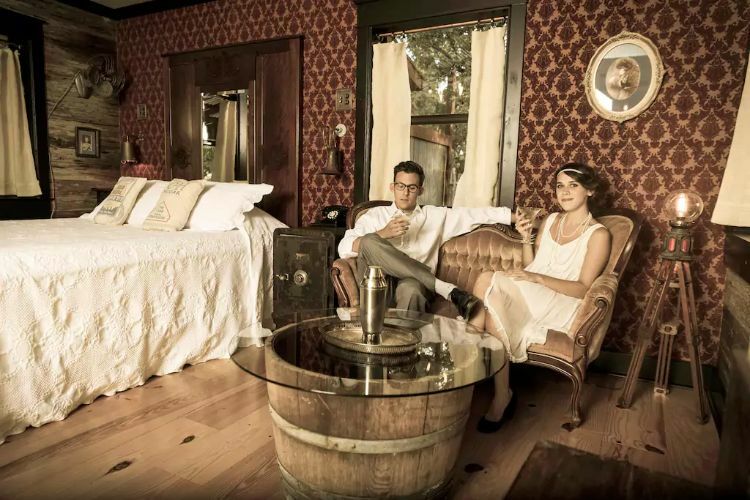 Owners and renovators of this romantic little cabin, Jennifer and Gregory are seen dressed in 1920s prohibition era getup, posing in their pretty open living and sleeping area. What we adore about this space is the wine barrel coffee table for cocktails, the Edison bulb lamp, and that beautifully tufted couch. Here you can get a better look at this cozy little living area. The couch is flanked by a safe - totally hiding illegal moonshine - and that beautiful steampunk inspired light with the giant bulb. Plus, take a look at that wallpaper! We love the red on pink with the velvet finish - totally luxe. On the other side of the cabin lies the big, beautiful bed. Covered in crisp white linens and with a stunning view of the property outside, this bed looks great while tucked in the perfect location. Everything about this kitchen is vintage and chic. 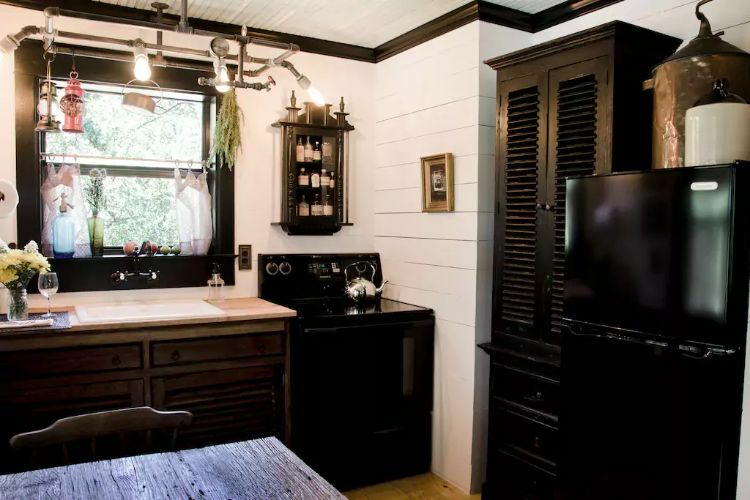 The white-washed wood walls contrast beautifully against those old, worn cabinets and the addition of that black pantry and pipe steampunk overhead lighting add a vintage and masculine feel. Then there's the bathroom. 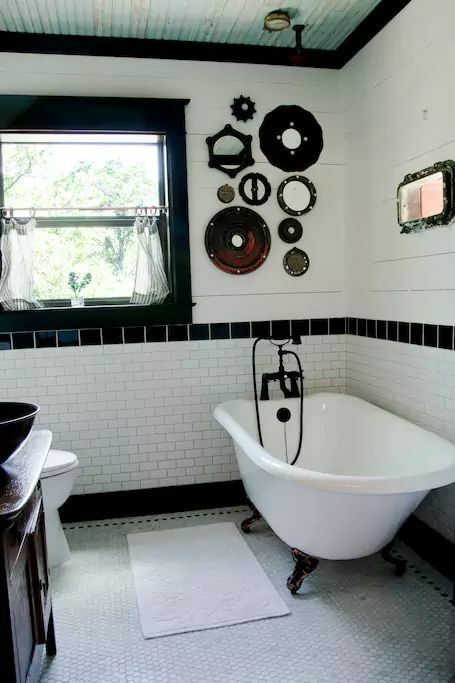 This space really looks like a bathroom out of the 1920s with its hexagonal marble floors and white subway tiles. Plus, look at that giant clawfoot soaking tub! What a luxury. 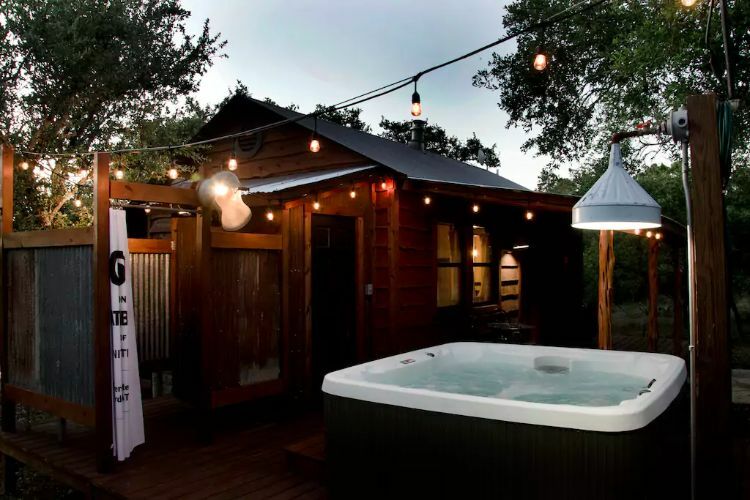 As if this tiny cabin didn't pack enough style and surprise, Jennifer and Gregory have decked out this home with a stunning porch, outdoor shower, and incredible hot tub. 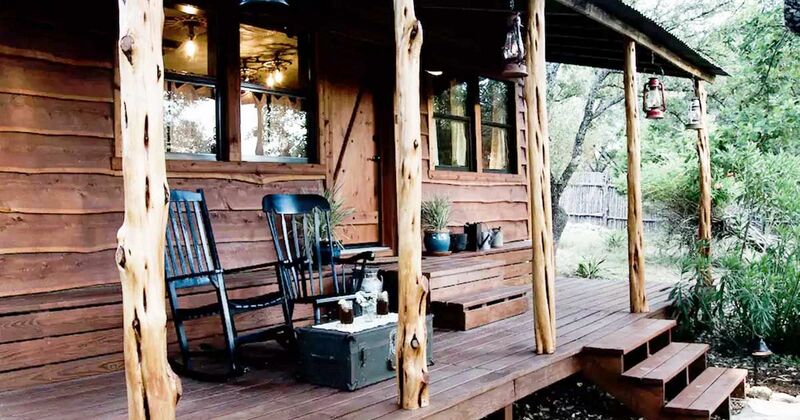 This addition really makes this cabin the perfect romantic retreat. Share this incredible vintage design with your friends on Facebook, Twitter and Pinterest.